Once in this metrics mode, you can get at two types of metrics: touchpoint metrics and "in-between" metrics. You'll quickly notice that touchpoint metrics are actually the exact same as campaign metrics - the only difference is that the metrics are now calculated for the individual touchpoints. This means that campaign metrics are really the aggregate metrics for all touchpoints within a campaign. Starting off simple - let's say you launch a newsletter campaign that has a single touchpoint. In this case, the touchpoint metrics will actually be the exact same as the campaign metrics on the campaign list page - there's no extra work to do! 100 sends of the one touchpoint equates to 100 sends overall for the entire campaign. Now let's go a step farther. Let's say you have a cart abandonment campaign with two touchpoints, both emails. Each of those touchpoint's metrics will be calculated separately. If 10 customers receive the first touchpoint, and 5 customers opened the email, that's an open rate of 50% for the first touchpoint. If 5 of the customers receive the second touchpoint (we'll say the others exited the campaign with a purchase), and 1 of those customers opened the email, that's an open rate of 20% for the second touchpoint. 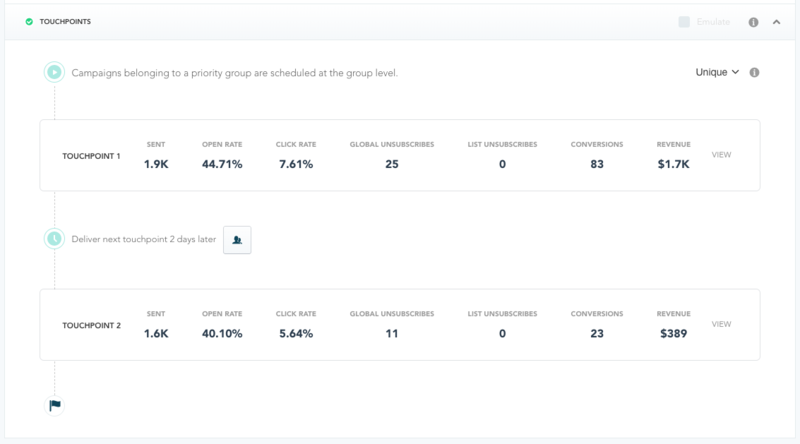 When calculating the campaign-level metrics, we have to sum up all the numbers - in this case, we'd end up with 15 total sends and 6 total opens across both touchpoints, and thus a campaign-level open rate of 40%. For a deeper dive into how these campaign (and touchpoint) metrics are calculated, see the campaign metrics doc. Between touchpoints, right next to the wait timeframe, you'll see a button with a person on it. Click that, and you'll see a few additional metrics - Waiting, Exited, and Timed Out. Waiting: The number of customers who received the previous touchpoint, but are still waiting to receive the next touchpoint. Exited: The number of customers who exited the campaign series by matching the event match exit criteria. Timed Out: The number of customers who were not reachable after waiting the amount of time set for the unreachable exit criteria. Reprioritized: The number of customers who were removed from the campaign because they qualified for and started receiving a higher priority campaign. Note: this only appears for campaigns within a prioritized campaign group. For more information on the event match and unreachable exit criteria mentioned above, see the campaign series creation doc.